BJP has fielded Nirupam Chakma, a veteran Chakma leader as well as the state vice-president of the party. The 17th Lok Sabha election is all set to begin from April 11, Thursday. The polling will take place in seven phases in a span of 39 days. In Phase 1, there are total 91 seats across 20 states and Union Territories, including Mizoram that will be casting vote. The state will also witness a triangular contest in the Aizawl West - I assembly by-poll on the same day. Mizo National Front (MNF) has fielded C Lalrosanga, a former Indian Broadcasting Programme Service (IBPS) officer and retired Director General of Doordarshan. Sports journalist Lalnghinglova Hmar, also known as Tetea Hmar, is contesting as an Independent candidate backed by key opposition parties Zoram People's Movement (ZPM) and Congress. TBC Lalvenchhunga of the newly-floated People's Representation for Identity and Status of Mizoram (PRISM) is also in the fray. Lastly, independent candidates Lalhriatrenga Chhangte and Lalthlamuani are also taking part in the contest. Lalthlamuani, who runs an NGO for the Jewish community, is the only woman candidate contesting from the Mizoram seat. Women voters have again outnumbered men in Mizoram. Of the total 7.84 lakh voters, 4.02 lakh are women and 3.81 lakh men. There are 52,556 first-time voters, and a total of 6 third gender voters in the state. Among the 1,175 polling stations, 117 will be women-only booths, officiated by female security personnel and officials. 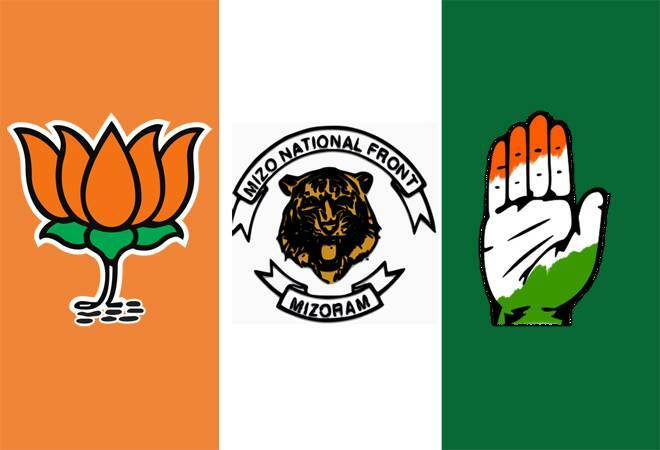 Bru voters lodged in relief camps in Tripura would also exercise their franchise for the lone Lok Sabha seat in Mizoram on April 11. There will be 15 special polling stations established specially at the Mizo-Tripura border village of Kanhmun, where 12,081 Bru voters will cast their votes. Election Commission has instructed the state to make special arrangements for the Bru community sheltered in six relief camps at the neighbouring North Tripura district. The ECI has also instructed the Tripura government to arrange transportation of Bru voters from their camps on the voting day. In 2014 Lok Sabha elections, Mizoram had a voter turnout of 61.95 per cent out of 7.02 lakh registered electors. C L Ruala of Indian National Congress won with a vote share of 49.3 per cent. However, Congress faced a crashing defeat in 2018 assembly elections with Zoramthanga of the Mizo National Front replacing Lal Thanhawla of INC as the chief minister of Mizoram.